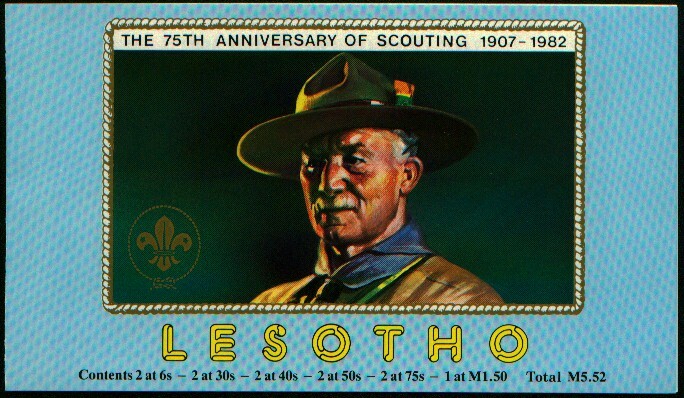 Lesotho issued in 1982 a booklet containing two of each of the five scout stamps and one souvenir sheet. 7,000 booklets were made. This booklet also exists imperforate, containing two imperf sets and one imperf SS inside the booklet. They were proofs from the Format International Security Printer Ltd's archive files and only six imperforated booklets are believed to exist. The illustration on the reverse shows camping scouts with flags. The inside of the booklet cover shortly presents BP and the Scout Year 1982 and has a list of important years in Lesotho’s history. Text and Web Layout - Copyright © 1999-2014 Hallvard Slettebø.